As you become Paleo, the sweet pancake breakfasts become fewer and fewer until you eliminate all glutenous grains, but they never become completely non-existent… there is such as sweet potato pancakes you know. And they are incredibly tasty, but very heavy on the carbs. So, what’s a keto-loving person to do? Reach for the egg carton and make a nutritious leek and bacon filled omelet instead. Your tongue will thank you, your body will thank you, and anyone else sharing breakfast will thank you too. What can be a better way to start the day than that? 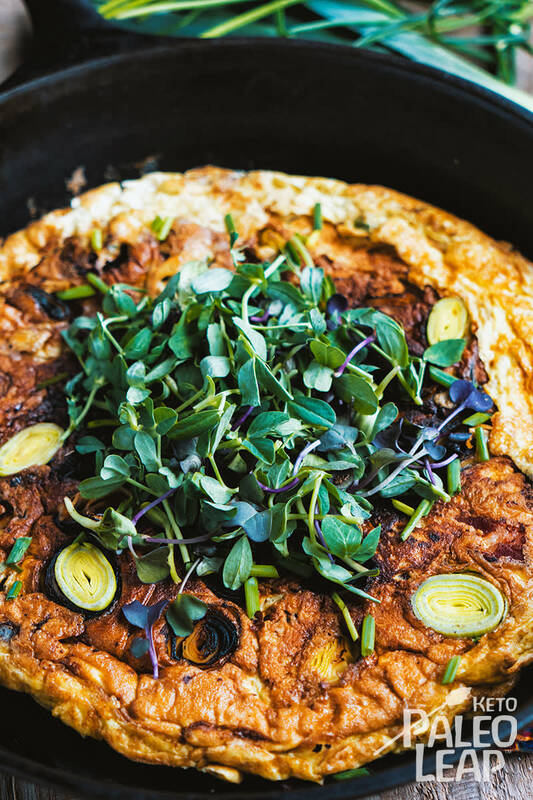 Once you have perfected your omelet cooking skills you can move onto a myriad of other keto breakfast ideas, in the meantime, back to your eggs. Eggs are nature’s perfect food, but you’ll want to invest in the best you can afford: organic, free-range, farm-fresh. As a versatile food you can find creative ways to fit them into any meal of the day, though they will always be a classic breakfast food in our book. What you want to do is to beat them gently, all 8 of them, add a pinch of salt and pepper and let them sit for a moment. Add your chopped leeks to a hot pan with ghee (or coconut oil if dairy-free), cook until soft, then add the eggs, pushing the cooked portions from the edge towards the center. When time comes, fold the omelet over (shredded cheese optional) with a quick flick of the wrist. Serve with fresh microgreens. Lightly beat the eggs in a bowl and season to taste with salt and pepper. In a skillet, melt the ghee over medium heat. Add the leek and cook until soft, 5 to 6 minutes, stirring frequently. Pour in egg mixture and add the cooked bacon pieces. As eggs set around the edge of skillet, gently push cooked portions toward the center of skillet. Tilt and rotate skillet to allow uncooked egg to flow into empty spaces. Carefully flip the omelet over and cook another 2 to 3 minutes are until eggs are fully cooked. Let rest 4 to 5 minutes and serve topped with fresh microgreens and chives.